Pre heat your oven to 400 degrees F.
Heat 1 tbsp olive oil in a pan over med-high heat. Add the butter and the crushed garlic clove, and melt into the oil. Add the chicken, and lightly brown 2-3 minutes per side. Remove to a plate. 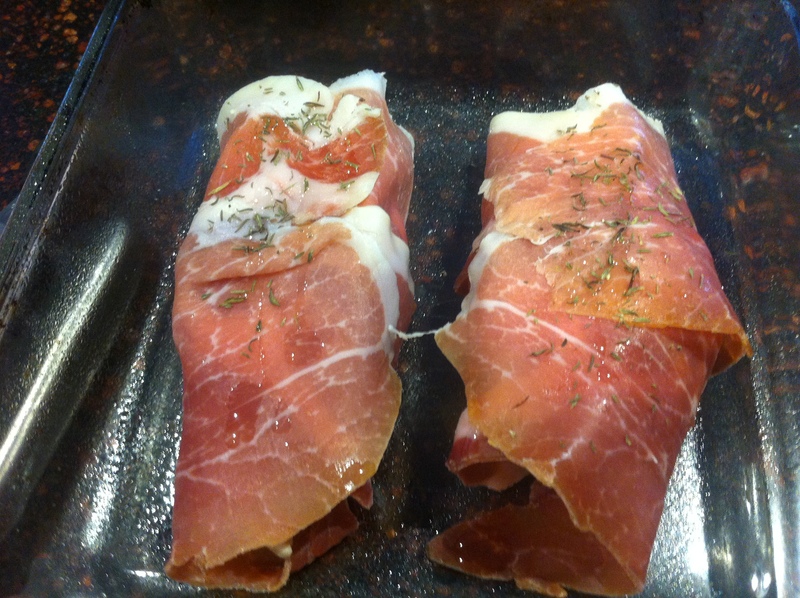 Sprinkle the chicken with the chopped thyme, and top each piece with a slice of smoked mozza, and then wrap with the prosciutto. Arrange on a baking sheet, and place the chicken BACK in the oven for 15-20 minutes, or until finished. While the chicken is cooking, heat oil in a skillet over med-med high heat. Add your slices of tomato, season with salt and pepper. Let the tomatoes get golden, flip, and then do the same to the other side. When they are finished, sprinkle them with the grated parmigiano reggiano cheese and the chopped basil. Serve. This entry was posted in Chicken Dinners and tagged chef, chicken, chicken dinners, delicious, fresh ingredients, local, master chef, organic, prosciutto, yummy. Bookmark the permalink. Pingback: Oven Fried Chicken with stuffed red bell peppers | Cooking Adventures!